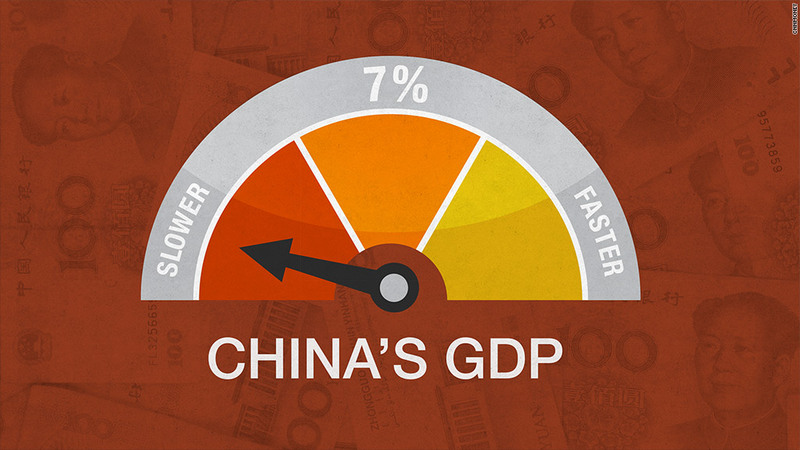 China is expected to post its weakest quarter of economic growth since the 2009 financial crisis, according to a CNNMoney survey of economists. Gross domestic product is estimated to have grown by 6.7% in the third quarter, compared to the same period last year, based on the survey's median estimate. That's much lower than the 7% GDP growth rate China delivered in the first half of 2015. The official GDP data will be published on Oct. 19. For 2015 as a whole, economists are now expecting growth of 6.8% -- below the government's own 7% target. Next year looks even more sluggish at 6.5%. After years of rapid expansion, the world's second-largest economy is cooling fast, partly due to government efforts to switch the focus of activity away from building infrastructure to consumer spending. Economists have been adjusting their estimates recently to reflect poor data and turmoil on China's stock markets, and Beijing's modest response thus far. "Even as growth has come down, the government has abstained from high profile stimulus efforts," said Louis Kuijs of Oxford Economics. "That is because ... policymakers have so far not felt that the deceleration of growth has been severe enough to warrant a major, high profile stimulus." The government is expected to unveil its five-year social and economic plan for 2016-2020 at the meeting. Experts say the government will likely continue with piecemeal stimulus to support the economy and keep risks -- such as flagging property investment -- at bay. The central bank has cut interest rates a handful of times this year, and told banks they could lend more. Although many China economists -- and the IMF -- are refraining from sounding the alarm bell, things have been a bit rough in China lately. Investors had a tumultuous summer, as stocks plummeted before stabilizing. At one point, the crash had wiped away more than $3 trillion in market value. Beijing also forced a surprise devaluation of the yuan, adding to worries that the government was losing control of the economy's health.